Mönchengladbach - Borussia Mönchengladbach's schedule could hardly have been busier in the first two weeks of the season, with five games to negotiate across three competitions. Yet the Foals have taken it all in their stride, registering three victories, one draw and just a single defeat. However, that solitary loss proved a costly one, ultimately denying the Foals a place in the UEFA Champions League following a play-off stage reverse against Dynamo Kyiv. It stands in contrast to their otherwise impressive start in the Bundesliga (four points from two games) and progression to the second round of the DFB Cup. "It's been a decent start," summarised sporting director Max Eberl. Gladbach sensationally secured fourth spot last season after avoiding relegation by the skin of their teeth the year before. A bumpy ride was expected this term, especially after the loss of key players Marco Reus, Dante and Roman Neustädter. 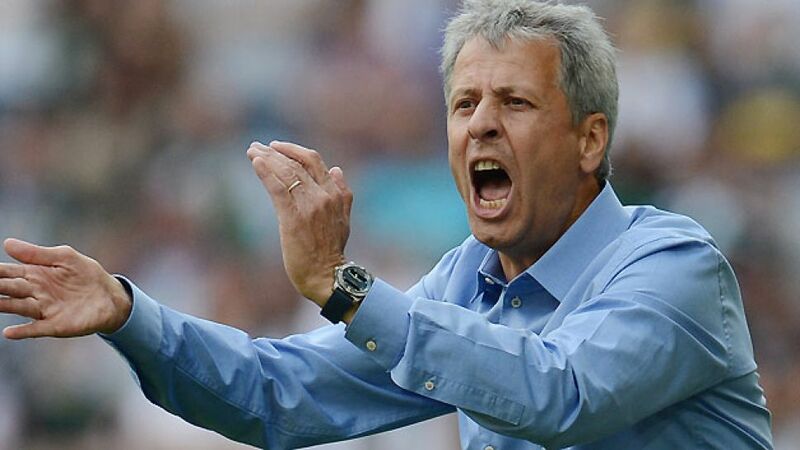 "It's like Barcelona losing Messi, Xavi and Gerard Piqué," Swiss coach Lucien Favre said in the summer. Reus was Gladbach's most influential figure last season and accompanied his 18 goals with eleven assists. The Germany international played in several positions, giving the side extra variation, but there is no player in the current squad that matches his speed, agility or versatility. Favre is still searching for the appropriate tactics and is yet to settle on a preferred strike partner for newly signed Netherlands forward . Igor de Camargo and Mike Hanke are also vying for a spot in attack, but of that trio, so far only the latter has netted in the league. While midfielder Juan Arango has seamlessly carried on last season's outstanding form, Favre is keen not to overburden the Venezuelan with total creative responsibility. To that end, the tactician fielded 20-year-old playmaker Tolga Cigerci in an advanced role against Fortuna Düsseldorf last time out, although questions are still to be answered after that tie ended goalless. Given the many changes, the international break came at an inconvenient time, denying Favre the opportunity to further integrate the new faces with the more established stars. Nevertheless, several of his starting line-up will return buoyed by victories in FIFA World Cup 2014 qualifying. Granit Xhaka (Switzerland), Havard Nordtveit (Norway) and Arango all tasted victory with their respective nations, while goalkeeper Marc-Andre ter Stegen was an unused substitute in Germany's wins against the Faroe Islands and Austria. Yet in their transitional state, Gladbach may have a hard time of things when they host 1. FC Nuremberg on Saturday afternoon. The Bavarians likewise have four points so far and travel north boosted by their 1-1 draw with defending champions Borussia Dortmund last time out. That said, anyone who knows Lucien Favre also knows he is likely to have an extra trick or two up his sleeve.